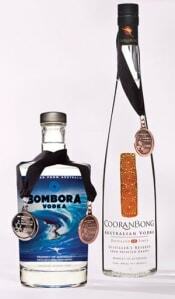 Full Disclosure: The Bombora vodka used in this recipe was a gift from G’Day Imports, L.L.C. However, this is not a paid review and the opinions expressed within are strictly my own. I really wanted to get this post up last night, but it was New Year’s Eve AND I made these cocktails. Pom-Bom-Spice-Tini Cocktails. You know that category on Jeopardy … Potent Potables? Oh, boy, do these cocktails fit that category! Need to mellow out a bit? Then, this is definitely the drink for you (provided you drink responsibly, of course)! 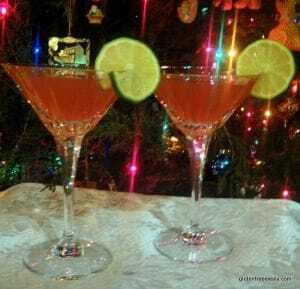 I created this drink using the very fine Bombora Vodka that the folks at G’Day Imports, LLC. sent me. They also sent me some CooranBong Vodka. Both are from Australia. First, let me say that receiving quality vodka in pretty shiny bottles has been one delightful highlight of blogging and the gift was certainly well timed for my two-year blogiversary. Yes, I am weak for beautiful bottles containing fine spirits and this Bombora vodka certainly qualifies. Bombora Vodka is made from quality grapes from Australia’s Barossa Valley—the same grapes that are used to produce acclaimed Australian Shiraz and Cabernet Sauvignons—as well as pure Australian water, and then distilled five times to remove all impurities and ensure a smooth taste. If you are curious about the name, Bombora is aborigine for reef and surf talk for massive wave … that latter definition certainly seems appropriate. While distilled vodka and others spirits that have not had gluten added after the distillation process are considered gluten free, some folks still want to avoid grain-based alcohol and others say they have reactions to alchohol made from grain—distilled or not. As someone who reacts to the gluten-free products that are less than 20 parts per million (ppm) gluten despite the constant statements from celiac experts stating that these products are safe for those who can’t eat gluten, I am not about to argue with individuals who choose not to imbibe grain-based alcohol. Many who avoid grain-based alcohol have relied on potato vodka. For years, I kept potato vodka in my liquor cabinet for a friend who had celiac disease and preferred grain-free vodka. * I’d have to say that this Bombora vodka is a much smoother option—oh, yeah, very smooth—and, therefore, a better option. I confess that I didn’t sample it straight myself (I’m a total chicken when it comes to such things), but Mr. GFE did and gave this Bombora vodka his nod of approval. These Pom-Bom-Spice-Tini Cocktails would fit in the Jeopardy category of "Potent Potables." Mix all ingredients in shaker glass with additional ice. Discard ice in martini glasses and wipe glasses dry on outside, if needed. Shake and strain Pom-Bom-Spice-Tinis into glassses. Garnish with lime or orange slices or twists; enjoy! If you’d like to read more on these vodkas, be sure to check out the websites for Bombora and CooranBong (where you can also read more on G’Day Imports, LLC and its mission). Oh, and I’ll be back with a recipe using CooranBong vodka in the future … after we recover from this recipe creation/taste testing. We don’t indulge too much these days, so we have to pace ourselves, you know? Incidentally, CooranBong vodka is distilled 10 times—can you say ultra smooth? Here’s some other “buzz” on these pure Australian vodkas, too. *A sad side note: My gluten-free friend for whom I kept potato vodka stocked died from complications of lymphoma a few years ago. Did you know that there’s a much higher incidence of lymphoma in individuals with celiac disease? If there’s a lymphoma diagnosis and the individual has not been tested for celiac disease, he/she should be. Here’s one article on the incidence of lymphoma in those with celiac disease. The silver lining is that a higher diagnosis rate for celiac is lowering the incidence of lymphoma because the likelihood of lymphoma goes way down once a person with celiac eats gluten free. It is important to note that while this study involved the National Cancer Institute in Bethesda, Maryland, the data came from Swedish cancer patients. The diagnosis rate for celiac is higher in European countries than it is in the U.S.
See a complete listing of the 25 Days of Christmas posts here. Originally published January 1, 2011; updated December 1, 2018. When I have a cocktail I pretty much stick to vodka – I will be looking into these two! Thanks for a good looking recipe, Shirley! Kristina–I’m betting you would love these vodkas, especially if you are a big fan. I easily found Bombora online, but haven’t looked for either locally or the CooranBong online to order yet. I’m not much of a cocktail drinker, but that sounds amazing. I didn’t know vodka could be made from grapes. It’s nice to have another grain free option for those who prefer it. Thanks for sharing your review. Shirley! Wow!! These look fabulous and a must-try (although I’ll have to use a different rum since I cannot get the spiced rum you use in yours). The combination will be fantastic, I just know! 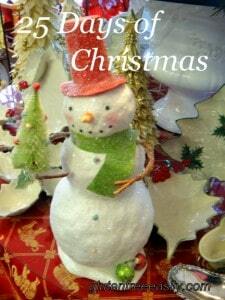 Thanks so much, as always, for sharing your creations! Hi Gigi–Thanks! These are indeed a very lovely cocktail. The spiced rum gave it a slightly different taste, but I’m sure they’d be great with some regular rum, too. 😉 Enjoy!